Henry James was an American writer who lived from 1843 to 1916. If he seems more an English writer than American, that’s because he did most of his work while living in England and, late in his life, gave up his American citizenship and became a British subject. He wrote about twenty novels, the most famous of which are The Golden Bowl, Wings of the Dove, and Portrait of a Lady. He is one of the key figures of nineteenth century literary realism. 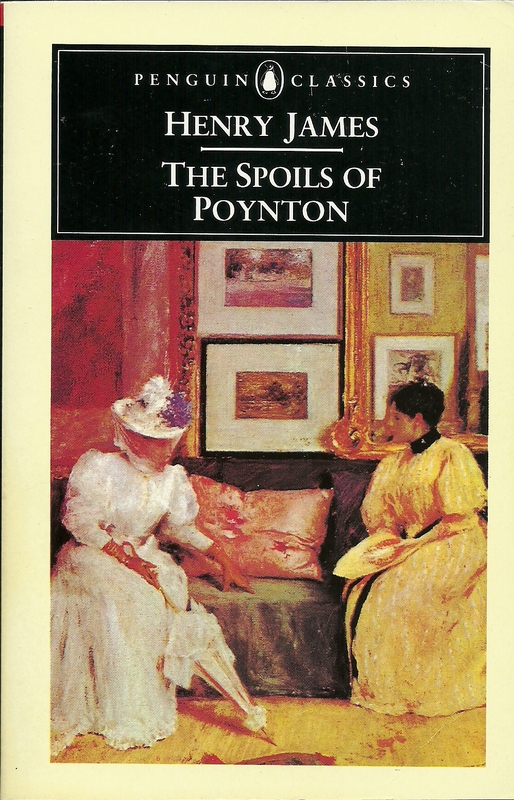 The Spoils of Poynton is a short (for Henry James) novel first published in 1897 that touches on the themes of greed, friendship, the nature of love and the strength of familial connections. Mrs. Gereth is a headstrong widow who lives on her estate called Poynton. Poynton is filled with “treasures” (these are the “spoils” of Poynton) that Mrs. Gereth and her late husband collected, including furnishings, tapestries, old china, paintings, object d’arts, etc. According to a silly and unfair English law, all the things in Poynton (including the house and estate) belong (upon the death of Mrs. Gereth’s husband) to her son, Owen. Owen can do as he pleases with his mother. He can put her out of the house of he wants to. He is under no legal obligation to her. Owen is engaged to be married to one Mona Brigstock, whom Mrs. Gereth, his mother, loathes. Mrs. Gereth can’t stand to see Mona installed in Poynton with all the “things” that she considers her own. She would do almost anything to keep Owen from marrying Mona. This is where Fleda Vetch enters the picture. She is a friend of Mrs. Gereth’s and Mrs. Gereth’s choice for Owen to marry instead of Mona. After Owen and Fleda meet a few times, they admit they have “feelings” for each other. Could it be love? Mrs. Gereth moves out of Poynton at the prospect of her son’s marriage to Mona and takes up residence in a place called “Ricks.” Ricks is all right in its own way but far inferior to Poynton. To mollify his mother, Owen tells her she may have a few (a dozen or so) of her favorite pieces from Poynton. She surprises everybody by taking literally everything. Owen is outraged and threatens legal action. (Apparently the desire for earthly possessions is more important than the mother-son bond.) Mona tells Owen the marriage is off until the things are returned to Poynton. She wants to marry Owen, it seems, only if Poynton and everything in it are part of the bargain. Mrs. Gereth’s friend, Fleda Vetch, is faced with a dilemma. She loves Owen and he apparently loves her, but she believes it would be improper for her to take him away from Mona. The only way she will get Owen herself is if Mona chooses to break off with him. Owen believes it his duty to follow through on his marriage to Mona, even though he seems at times to prefer Fleda. Which way will he go? Will Mona tell him she no longer wants to marry him? What will happen to the “spoils” of Poynton? Somebody once said that Henry James could find more drama in a raised eyebrow than most people could find in an earthquake. The Spoils of Poynton is a simple and engaging story told in Henry James’s inimitable grand literary style. If a thing could be said in five hundred words, he will more than likely use five thousand. Let’s see…how many ways are there to say the same thing?